Damages instead of healing. Deals some damage instantly. Ash Cloud: Duration: [12 / 13 / 14 / 15] seconds. Summon a scorching cloud of ash at the target location, reducing enemy Movement Speed by 70% and healing you and your allies for 1227 every 1 second. Cinder Storm: Summon a scorching cloud of ash at the target location, reducing enemy Movement Speed by 70% and healing you and your allies for [1562 / 1579 / 1596 / 1612] every 1 second. Eruption: Summon a scorching cloud of ash at the target location, reducing enemy Movement Speed by 70%. and deals 1367 Flame Damage every 1 second, Deals [3514 / 3552 / 3590 / 3629] Flame Damage immediately. Ash Cloud deals reduces the Movement Speed of affected enemies and heals allies over time. 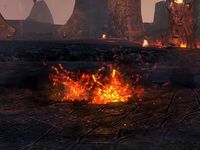 The Cinder Storm increases the amount of healing done to allies while the Eruption morph deals Flame Damage, instead of healing, over time and instantly. Eruption: Increased the initial eruption damage from this morph by 22%. Eclipse: Fixed an issue where this ability and the Total Dark morph could reflect snares from ground-placed ticking abilities, such as Caltrops or Ash Cloud, and cause you to move at extremely high speeds. Fixed an issue where this ability and its morphs could occasionally expire too early, causing you to lose out on the final tick of damage. 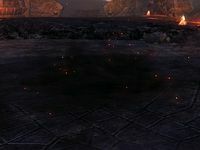 This ability now heals you and your allies in the area and snares enemies; note the Eruption morph remains unchanged. Cinder Storm: This morph now increases the healing done. Increased the healing done by approximately 50%. Cinder Storm: Increased the healing done by approximately 60%. Eruption: Increased the initial damage done by approximately 15%, and the damage over time by approximately 70%. Developer Comment: With these changes, Ash Cloud and its morphs will now provide a much larger impact than previously, and will be more in line with other class based area of effect duration abilities, such as Lightning Splash.